Conscientious homeowners want to take care of their roofs. Of course, everyone wants to be able to customize their own home, too. You should be able to! If you’re not a professional, you may not know what is and is not a good idea to do yourself. Here is our list of things you should never do to your roof and why. 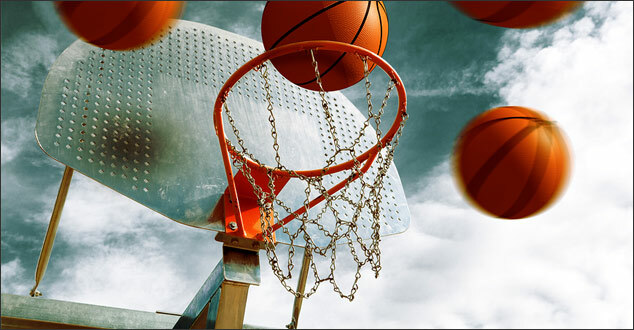 Think about it… the basketball hitting the hoop over and over causes vibration, which causes the bolts to break the seal of your roof. You don’t want broken seals and leaks! A roof mounted satellite dish means someone screwed bolts into your roof. Sometimes mastic will be sandwiched between the dish mount and the roof, but it can leak. Ask your provider to use an under eave bracket instead. Anything you attach to your shingles using nails or screws can cause leaks. Homeowners want the cleanest looking everything – including their roof. If you have black algae stains streaking down your roof, you’re may be tempted to get up there and power wash or brush it. Either that or you may be considering using an abrasive cleaner. The problem is, even though power washing will remove the algae, it will also remove the mineral granules that protect your shingles from sun, heat, impact and fire. This lessens the lifespan of your roof. Contact a roofing professional to assess the problem. 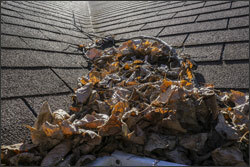 Ignore Debris in Valleys You should never ignore debris piled up in the valleys of your roof. Twigs, branches, leaves, seeds, you name it: it causes water to dam up and leak inside your home. You also need to keep those gutters cleared out. Anything that lets water sit anywhere on your roof is just asking for water leaks inside your home. Plus, if you let that go too long and it gets to be winter, you are looking at the number one factor for ice dam formation, which will cause leaking and damage to your roof and home. Maybe you’ve seen this happen before. A homeowner or contractor wanted to save money and put a new roof over an old damaged one. Don’t let it happen to your roof. Make sure when you are replacing your roof that you hire a company that does things right. Old and damaged roofing needs to be removed before any new installation. It is not a good idea to walk on your roof. You are putting yourself and your roof in danger by doing this. Walking on a roof rubs the granules off of the shingles. Fewer granules mean less protection. Hire a licensed roofing professional instead. Resist the urge to pull up shingles to search for leaks yourself, no matter how handy you are. Unless you are a professional contractor, you will very likely create more leaks while you’re up there doing that. In addition, and more scary for consumers, you may void any warranty in effect. Call the professionals! Skylights and roof vents are all fun and games until someone’s roof gets ruined. Be very careful about hiring someone to install things that require cutting holes in your roof. Professional contractors know that if you open a hole in your roof, it must be repaired correctly to prevent roof leaks. You must install flashing around the entire opening. A little sealant won’t do the trick. Be sure to consult a professional. With all the bolts being used during the installation of solar panels on a roof, some of them will leak. Instead, you can use a hidden bracket system. This is another place where a licensed professional is the right person for the job. Most professionals will be able to install a hidden bracket system instead and keep your roof safe. In conclusion, from installing a satellite dish and Christmas tree lights to improperly installing solar panels, there are certain things that a homeowner should avoid and never do to their roof. If you have any questions, or would like our assistance, please contact Renovations Roofing & Remodeling, Inc. We’re here whenever you need us!